U.S. senators and congressmen representing the Rio Grande Valley sent a letter Wednesday to the head of the Federal Emergency Management Agency, requesting documentation to show why damage to drainage and irrigation districts are no longer considered part of the agency’s program intended to aid local governments recovering from major disasters. Hidalgo and Cameron County emergency managers were notified this month, for a second time, that FEMA had denied providing public assistance grant money to local and county governments to the two counties as well as Jim Wells County. FEMA had previously rejected allocating the grant money, months after heavy rainfall flooded roadways, businesses, homes, schools and county buildings. Storms dumped 11 to 13 inches of rain in about three hours in parts of Weslaco, where homes were inundated with at least 18 inches of water on June 20, according to the National Weather Service. Harlingen received about 14 inches of rain from June 18-22. In McAllen, where about 2,700 homes flooded, rainfall totals reached nearly 11 inches during the same period. Other cities received about 2 to more than 18 inches of rain. The damage assessments conducted by FEMA and Texas Department of Emergency Management representatives following the flood found the two counties and Jim Wells County — the areas declared a major disaster by the president this summer — suffered an up to $20 million loss. To qualify for grant money through the public assistance program, the three counties needed to have suffered a loss of about $36.7 million. The storms brought “a year’s worth of rainfall to the Rio Grande Valley” and local and county leaders, conducting their own damage assessments, as part of the FEMA disaster assistance assessment process, calculated “nearly double” the about $36.7 million threshold set by the agency, according to the letter signed by U.S. Reps. Filemon Vela, D-Brownsville, Vicente Gonzalez, D-McAllen, and Henry Cuellar, D-Laredo, as well as Sens. John Cornyn and Ted Cruz, R-Texas. Hidalgo and Cameron counties sustained a $25 million and $30 million impact to county and city property, respectively, according to local emergency management officials. The drainage and irrigation districts in both counties conducted their own assessments. Hidalgo County Drainage District No. 1 calculated a $2.3 million loss. 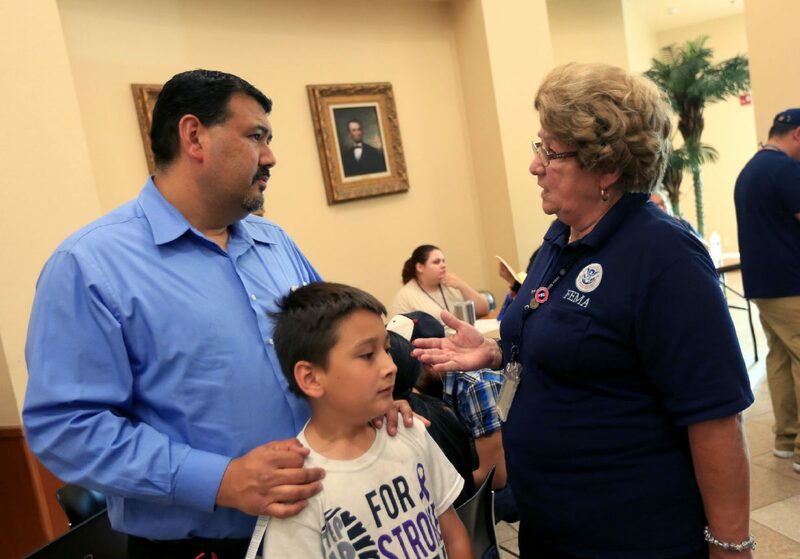 In Cameron County, three irrigation districts measured $11.6 million in damage, Hidalgo County Emergency Manager Rick Saldaña told a group of leaders Monday during a discussion about the denial of public assistance funds. There are 10 irrigation districts in Cameron County, according to county records. Damages to the districts’ property, according to local officials as well as the letter, are not considered in FEMA’s damage assessment equation. FEMA representatives still visited irrigation districts during their post-assessment process, but it remains unclear why, if the districts are not considered as part of the agency’s public assistance program. Previously, FEMA deemed irrigation and drainage districts eligible for public assistance funds in areas impacted by hurricanes Harvey and Alex, according to the letter. The letter called for a third assessment, if necessary, and documentation showing “the relevant change in federal law” showing why the agency excluded the irrigation and drainage districts. “We remain highly concerned that FEMA’s own damage assessments are significantly lower than the damage assessments provided by the counties, which we believe likely represents a flawed survey process,” the delegation wrote. Congressmen are planning an in-person meeting with FEMA officials, Vela said during the meeting Monday. “I urge Administrator Long to reconsider the current damage assessments and recognize the flawed process that made these determinations. Our constituents are not asking for favors, only the consistent application of law to the facts,” Gonzalez said in a statement.